Yes! I find him not too good in reflexes etc. He has around 65% of saves and I sure want someone better..
Lafont and Meret are of course in my shortlist, specially the first because just refused his contract then maybe I'll be able to buy him for a decent price! How much did you pay him? I'm very please to tie him down and especially pleased to have agreed a 160m release clause which should ward off any teams who may be sniffing around. If I let for example 5 non-eu players in loan 1 season, the next season will I be able to register all them? as long as they're all loaned in italy, yes. They take up the loaning team quota in place of yours. however obviously only teams with free spaces will bid for them. You can be extra evil recalling them the next day so it cleanses the status and they get nothing out of them, if you need them. but as i said, that's pure evil and i have done it. @Raymond85 is this something that only came in on the new database? I'm pretty sure despite spending two seasons at Udinese I can't register Dusan Vlahovic for Fiorentina. Or is that because he sat in my reserves for 6 months when he signed on in January as I couldn't find a loan? Also a general question to the group - what are the finances like for Inter, Napoli and Roma? 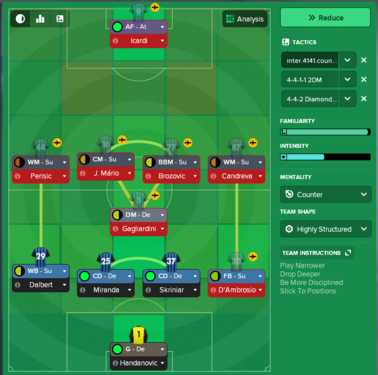 Thinking of starting a Serie A save - Roma would probably use my old United tactic to get the best out of Dzeko, or work on something new with the other two. I would probably make a lot of changes to the squads of Inter and Roma in particular, don't want to be down to 25% of transfer revenue by January 1st season or something ridiculous (although that could be a different challenge). 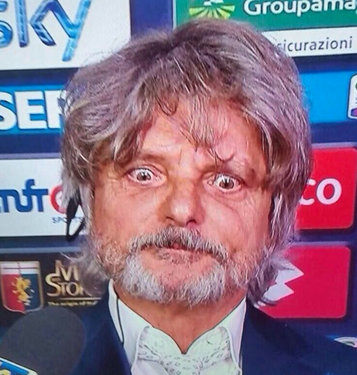 Inter is pretty terrible on this last patch, tbh. You don't have much money left for wages, but you do start with 17mil€ which is completely reasonable since the squad is more than good enough for top4 finish. But then it gets worse in the second season unless you set winning the title as priority. 20mil€ for transfers, no additional wage budget. 15mil p/a for wages if you select the title as your priority. Transfer revenue is also bad, 50% at best. Tip: I always make a save when the latest DB update gets released and save it before taking over a club. That way I don't have to set it up every time. No idea, i'm playing with Udinese and any new signing that is NeU in red, wich means extra quota, can be loaned to other clubs as i explained and gets cleaned straight away. I have done it with 4 players over 2 seasons. I've decided to have a go with Inter! I was torn between them and Roma, but I feel like with Roma I would have just used my (highly successful) 4-3-3 I used with Manchester United that seems almost perfect for their squad. Some inspiration from fmcatenaccio and this piece on In Bed With Maradona about the 1967 European Cup final and I've decided to attempt to try succeed with Counter-Attacking football, and to get the best out of a left back (I doubt I'll get anything like Giacinto Facchetti's goal record but I'll settle for a lot of assists to Icardi and/or high ratings). One thing that's a bit different for me is that Provided I can meet the Homegrown rules for Europe (4 trained at club, 4 trained in nation) I'm going to prioritise foreign players over domestic. Given the schism that led to the founding of Internazionale it seems appropriate to take it to an extreme. Also on a previous save managing rivals AC I went the opposite way, reverting to pre-Bosman "three foreigners" for my squad, and generally have a high domestic bias no matter where I play. I'm going with the original database because it just kinda feels right to me, I guess. 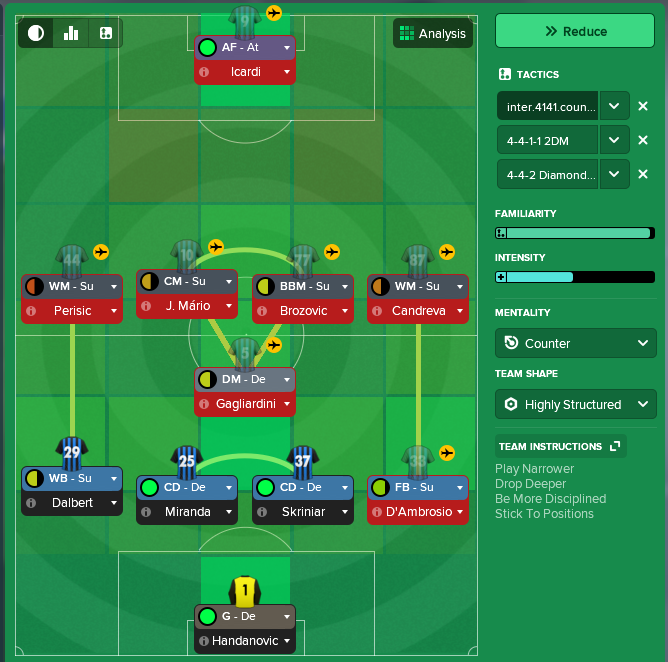 Also I'm leaning towards 4-1-4-1 in my initial thoughts and I don't want to try accomodate Rafinha (whom I've already used a bit on FM with Barcelona and signed with Lyon in the save I'm putting on the backburner). I'll keep you guys updated, but if anyone has any advice in terms of players to get rid of / sign, feel free to let me know. Hello, planning to start with benevento .. last year i had a long save with Parma. Just a quick question, when can i pre-sign players near the end of their contract ? in january ? Not playing the updated Jan patch with Rafinha but if you are looking to perhaps play someone behind the front man I'd recommend retraining Candreva, Had been playing behind Icardi/Lautaro Martinez (rec. signing) as an advanced playmaker with roam and move into channels Instructions has been a revelation before he dislocated his shoulder on Italian duty. It also allows Berardi to play on the right hand side as an inside forward. If looking for someone in defence Rodrigo Caio has been a rock for me. @Olivierlandman January for most leagues, but some Scandinavian and South American leagues give players contracts running calendar years, so if you were signing someone from say, Norway, you might be able to pre-contract them in July. @lblanc thanks for the recommendations! I've had a lot of previous experience with Berardi so will most likely only move for him to prevent Juve / Milan getting him (if he went to Napoli / Inter I'd accept it) as the whole point of this save is to be very different to my usual style of high domestic bias and progressive football. 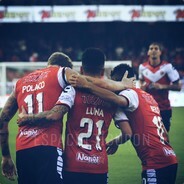 I'm definitely thinking Max Romero / Lautaro as a signing next year, I've already fell afoul of the nEU rules though - I've signed Rodrigo Dourado to play in front of the defence as a backup to Gagliardini but he doesn't qualify for the 2nd spot so I'm having to sell Nagatomo to free up a slot. 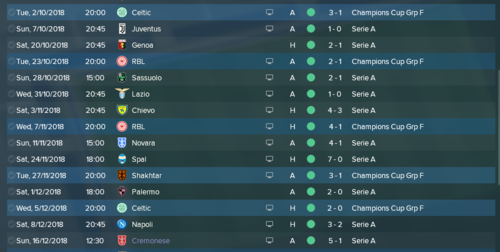 Going in to the 22/23 season now (season 6), and I'm still yet to win the Champions League with Juve. I feel I definitely would have had a chance to the last three seasons if I hadn't faced United (the eventual winners, obviously) in the final, semi final and quarter finals. I've won the league each year, and the cup all but once or twice. So I managed to sell the nEU Yuto Nagatomo abroad (to England) yet I still can't register Rodrigo Dourado. He won't go on loan either due to having just arrived so I can't use that exploit. Can anyone think why selling Nagatomo didn't work? I still have the restricted nEU slot available, because Dalbert is the only nEU player that Inter signed for real last summer, can I not free up a slot until I've already used that? Eight game unbeaten run ended with a bump, down to 10 men through injury and punished. @stevecummins78 what season is that? If its beyond first I'm impressed Inter have Icardi - Txiki Begiristain has been to 5/11 of my games so far. 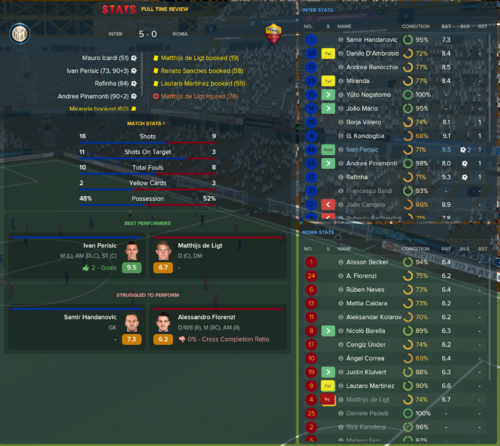 My own 10 game unbeaten run was brought to a swift end when we faced 2 strikers for the first time. It would have probably only been 2-1 but I opened us up when we scored a late 1st and we got punished. 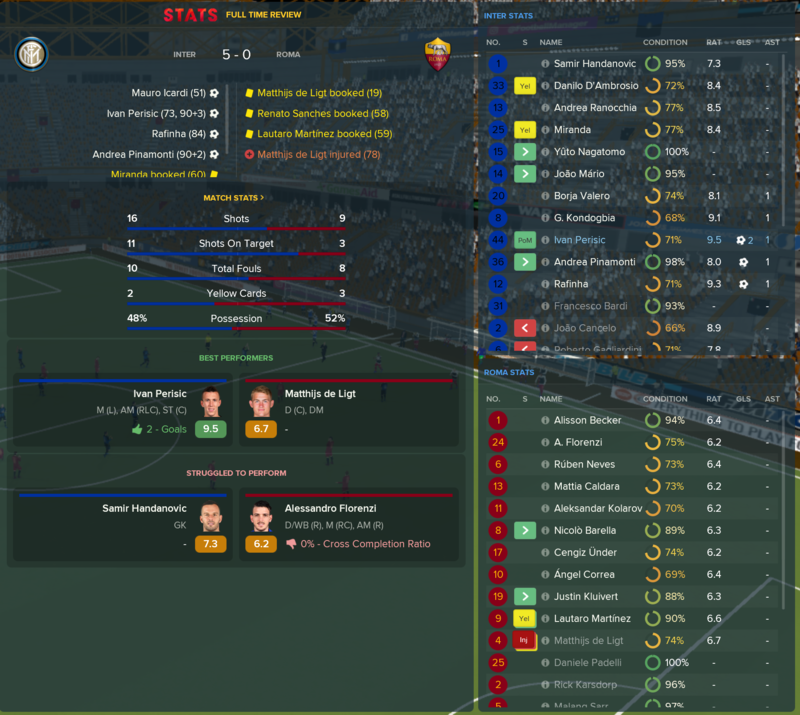 2 of my next 3 games are away to Napoli and Roma so we'll see whether that was dumb luck, inability to deal with 2 strikers, or us being found out after a hot start (in a previous attempt with Fiorentina I topped the table after 19 games then only won 2 in 2018). 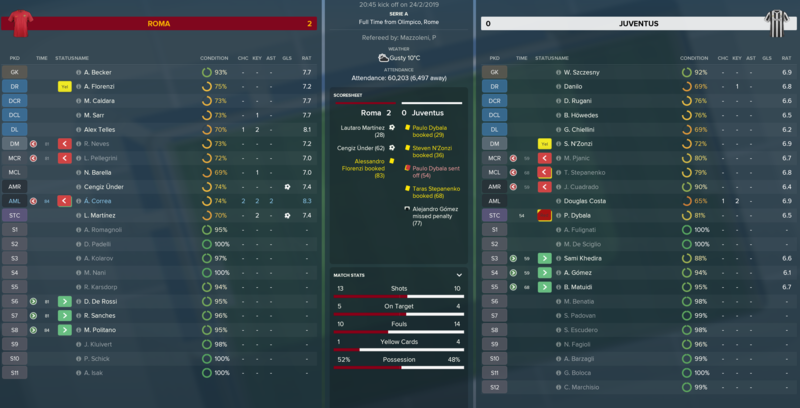 If you get Inter into Champions League I've found Icardi easy enough to keep, at least that's what happened in my save. Around Feb/Mar of my first season PSG, Man U, Real M, Spurs were all very interested in him, he even asked to speak if a bid came in, I asked him to hold off saying we'll qualify for CL when we did he dropped concern and then all but PSG and Spurs dropped their interest I then got him to sign a new contract after window closed did take him about a month to come back with his agreement to me but he signed. People can watch alright but as long as you say he isn''t for sale and praise him for his conduct once in a while he'll remain committed. Most of my saves he's ended up in the PL within a season. I've had to promise CL football as well - he's been significantly worse since I made that promise as it still lists him as unsettled, but he's still streets ahead of Pinamonit, Colidio and Odgaard and part of that is tactical - he's basically got Lukaku syndrome where he's so isolated by my setup that viewers would call him a flat-track bully. We're first in a close league so if I can work out the kinks in our tactic (we've been dreadful against big teams other than Milan and Roma) I'm confident. Given how we're haemorrhaging money there's no way he's getting a new contract though given how players still ask to leave within a few months of signing one. Decided to join Italy Downloaded Sortitoutsi starting customize date(started on 7th May 2018), so went on holiday til Serie A Finished, and so I went for Lazio who finished 5th. Alot of old players in the squad, will looking to offload them, Hoping to keep hold of Immobile, who is wanted by Tottenham and Liverpool. Hiya guys I have joined the Italian Revolution and become the new manager of Lazio, mainly cos I had fond memories of them when Gazza was there and also they have some quality players there that I can build a title winning team with. I have again used the Rashidi tactic but might tweak it a bit and see how it goes. Transfers wise I shifted all of my transfer budget into the wage budget. I sold Luiz Felipe for 250k, Flip Djordjevic for 2m and sold Dusan Basta for 2m as well. I only bought in a few freebies in Samir Nasri, Marco Amelia, Jean-Daniel Akpa Akpro, Andre Jali and Abou Diaby, I signed Antonio Matera for 200k and Davide Mondonico for 200k and signed V.Cerny and Calvert-Lewin on loan. Most of these are just to bulk up my squad a bit in case of injuries, most of these wont play and will be released or sold in season 2. I start my first game in change soon, will keep you posted. Unfortunately,FM kept crashing so my Lazio career comes to the end At some point I will start new save soon. So this bodes well for next summer's transfer dealings! At least I had a busy January and February 1st. Three free transfers arranged - Rodri (Villarreal), Marcos Llorente (Real Madrid) and Dario Maresic (Sturm Graz) - and two I arranged for summer the second the deadline passed - Felice D'Amico (Palermo) and Federico Dimarco (Sion via our academy). In terms of competitions we're 1st in the league, 2 points ahead of Juventus (we have a game in hand) with an unbeaten home record soon to be challenged by the visits of Lazio, Napoli, Roma and Juventus. 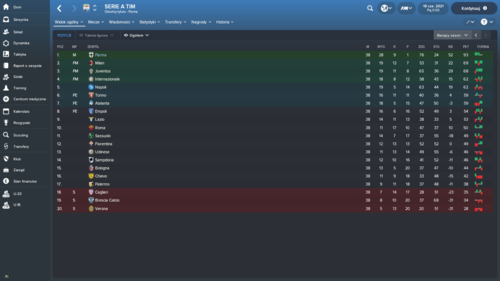 Really hoping I have the league wrapped up before the final day as Juventus hammered us at their ground. As I set out to play on the counter and prioritise not conceding over all else, 17 clean sheets in 26 games is good going too! Well this was a weird news item I just got lol. @Ronaldo Beckham Lotito wheeling and dealing! It surely has to be an error. Been awhile since I updated about my Inter save. I'm now just before Christmas and We have been unstoppable!! I've been given 18m to spend in January which I'm going to use to make Florenzi and El Sharwary's move permanent as they have both been amazing. I am happy with only 24 goals conceded and 23 clean sheets, but we were 12th best for goals scored with 49 which needs to improve - we had 5 0-0 draws and only scored in 2 of our 7 losses as well. Going forward I'm considering perhaps a switch to 4-4-2, with Icardi and Pinamonti as first choice, and some combination of Colidio, Odgaard and a new signing as backups. Also hoping to sell off some high earners in midfield as I have Marcos Llorente, Rodri and Felice D'Amico joining (The former two on frees) and should finally be able to register Rodrigo Dourado after he spent an entire season not playing. Federico Dimarco is returning to cover left back as well, and Dario Maresic is a further defensive reinforcement. A right back, preferably who can also play on the left, is a priority as I simply do not trust Davide Santon with his 10 concentration. Matteo Darmian is transfer listed for £12m but that would be 2 thirds of my budget gone on a rotation player. Eyeing up Predrag Rajkovic as the long term replacement for Handanovic too, although Ionut Radu also looks an outstanding prospect in our reserves. As you'd expect, 20 goals and 9 assists from 30 appearances has led to some decent development from him. Not sure what the registration situation will be though. They tried to get him for less than the clause, so I rejected, now he's back with me. May loan him out as Candreva looks like he has at least one good season left in him before I should sell, and is actually earning half the wages as well. 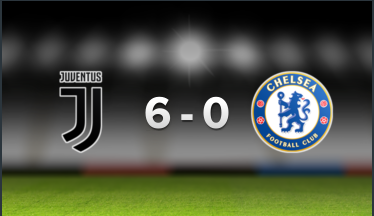 February 2019 and a HUGE win over champions Juventus, cutting the gap at the top to six points. Still a big ask to catch them, but we have some easy games coming up and the team are in great form. From memory nobody in this thread has on the current version, but I've always liked them due to their cool kits and badge, so I hope you go for it! Torreira and Linetty in midfield are outstanding prospects (and already good Serie A players at the beginning), and if you sort your tactics its a squad that can easily make a tilt for Europe. My only outgoings so far have been Padelli (loan with mandatory future fee), Bardi (a £2m loss on the initial purchase) and Gabigol (loaned, for £250k / month plus wages, to Real Madrid of all teams). Witht he first database before i had problems with bugs.. Btw amazing team, I really enjoyed even because I play with a 4312 / 41212 and that team is really good! 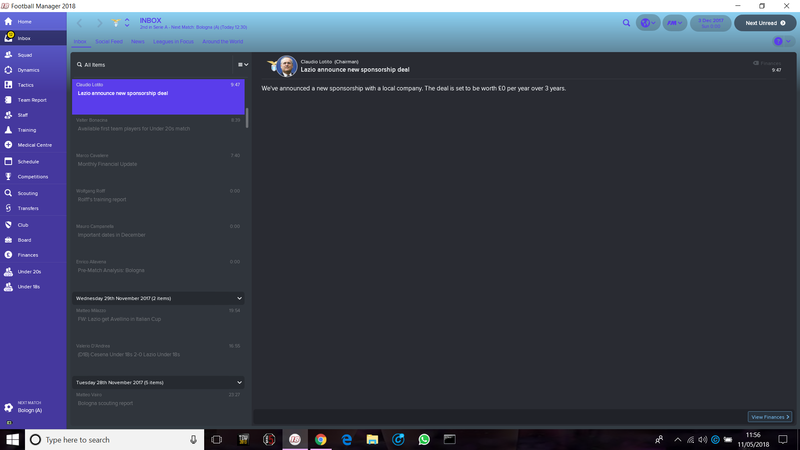 So I've just finished summer and played my first game of season two (weirdly on 1st September), with 9 incoming players and 34 leaving either permanently or on loan probably one of the busiest pre-seasons I've ever had on FM. In terms of incomings: Roberto Gagliardini (£17.75m), Marcos Llorente (free), Rodri (free), Dario Maresic (free), Geronimo Rulli (£7.25m), Felice D'Amico (£575k), Federico Dimarco (£6.25m), Maximiliano Romero (£4.7m) and Joe Gomez (2 year loan with no recall). Looking at our ridiculous debt repayments I made good use of expiring contracts, which was a good idea as we were on 25% of transfer income and nobody would leave. Rulli was an impulse buy as he was going to go to West Ham and I noticed he is a Model Professional. 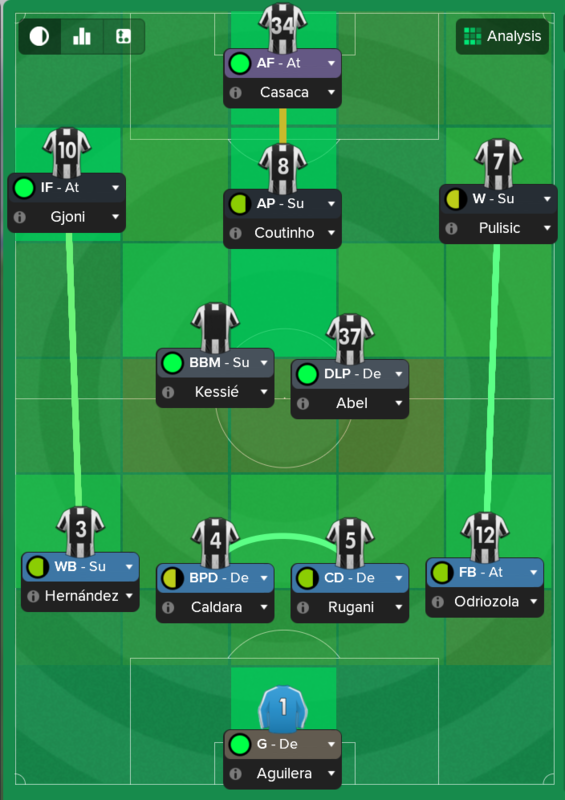 I already had Gagliardini so technically Gomez is the only one who goes into my ideal starting 11, the rest being improvements on squad depth so that we can go toe to toe with all the other (non-Juventus) top teams even when I have to rotate. 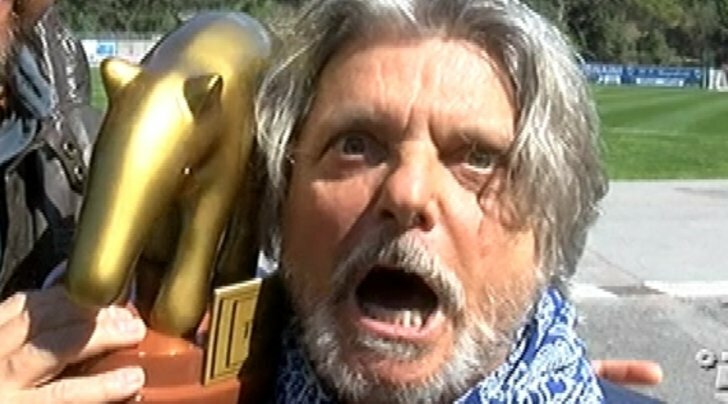 I'm not going to list all my outgoings, just the big four I bitched about a couple of posts higher up and one other. Davide Santon was in popular demand and I don't trust his 10 concentration so went for £10m plus add-ons to Swansea in June, I eventually managed to squeeze £12m out of Leipzig for Matias Vecino (£9.5m loss), recouped the £8.75m outlay on Eder to Lazio, Kondogbia rejected half of Europe but eventually Arsenal offered 100% of wages, £250k per month and £15m next season, and I settled for just getting Brest to pay Borja Valero's wages. Hopefully I'll manage to get my £4.9m back next year. Not enthused about my CL group though: Arsenal (who have dumped me out of it on every FM18 save except with Manchester United so far), Real Madrid and Besiktas. Europa League challenge it is! 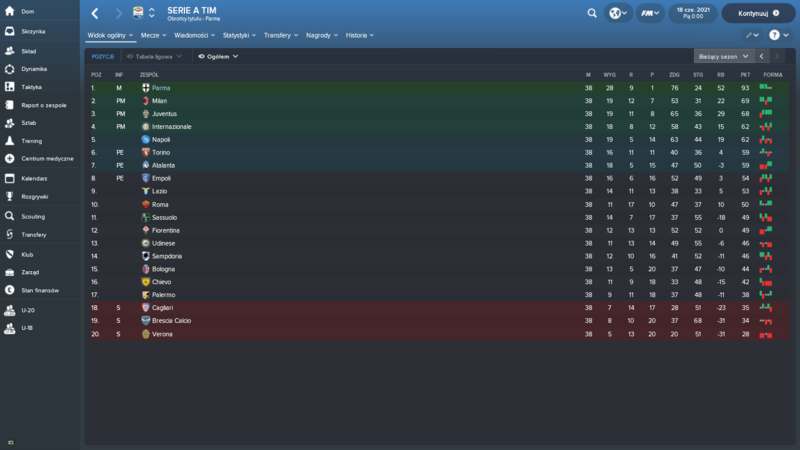 Serie A is a bit easy.... Goin into my 4th season with Inter. 3 Leagues, 3 cups, 1 Champions League, beaten in 1 CL final. Sweeping the boards, once you invest wisely you are sorted. Have 200mill in the bank, from selling my Top players (Brozovic 60mill to china, Kondogbia 50 mill to Bournemouth, Perisic 55 to Liverpool etc). 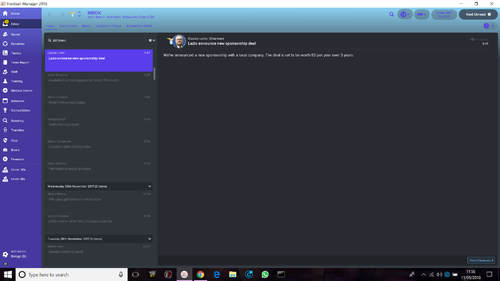 replaced them with top quality youngsters (who dont break the bank) and watch them excel... Melegoni, Michelotti, Pavon, and a couple of quality regens for under 5 mill who imedaitely spring to 30 mill once signed. 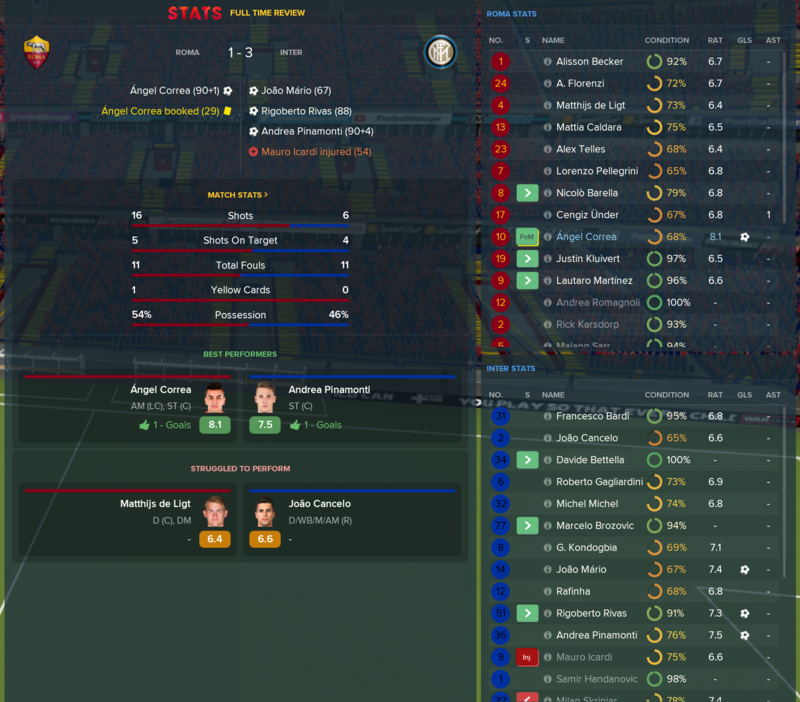 My biggest gripe is after 2 seasons the AI are terrible in Serie A... I have walked the last 3 seasons, without being phenomenal... They dont buy any top players and sell their best lads without replacing.. Winning the Champions league to round off a treble winning year last night was absolutely unreal... started this season by beating Roma in the super cup 7 0 ..... think I might have to start a new game. I enjoying my calcio career. It's pretty easy when Juventus got bad season. 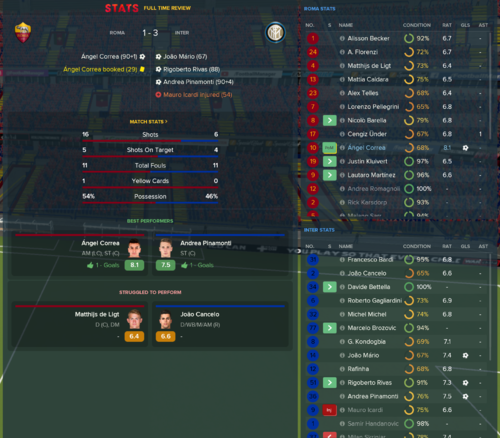 Out of the cup in the semi-final against Inter, my fourth defeat on a row against them. This after dominating until they took the lead with their first attack. Gutted. Agree it gets a bit too easy if you invest correctly. so Italian clubs just selling their stars and replacing them with average free players on most calcio saves? @stevecummins78 How do you set up your Roma side with Pellegrini and Barella in the starting line up? A 4132 DM with Ruben Neves as a DLP, Pellegrini AP or CM(A) and Barella linking it up as a Carrillo or a BTB. To be honest I’m not sure it has worked well enough, so I’m thinking of signing Denis Zakaria for more physicality in there and then barella will be cover or loaned out. 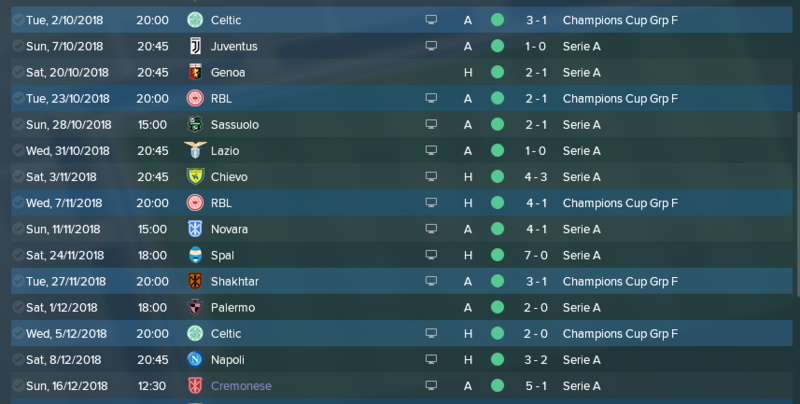 A little bored of my Juve save now, looking for something new. Not sure who to try, if I stay in Italy. Maybe Inter? What're their finances like?